Summer squash (yellow crookneck or zuchini) is a tender vegetable. The seeds do not germinate in cold soil, and the seedlings are injured by frost. Therefore in northern states it is best to start seeds indoors about 4 weeks before planting outside which is at least two weeks after last frost. 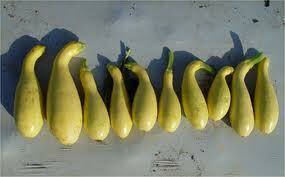 With bush type summer squash you would want three plants to make up a bush. Harden off by cutting back on water and reducing temperature before transplanting. Do not plant seedlings until all danger of frost is past and soil is thoroughly warmed. Wait until the soil is 60oF to 65oF before planting. Fall Planting - You can plant summer squash for fall harvest right up to the first frost. Plant seed directly into the soil 12 to 14 weeks before expected first frost. Harvest should be 85 to 100 days from starting seed. Seed can be saved 6 years.